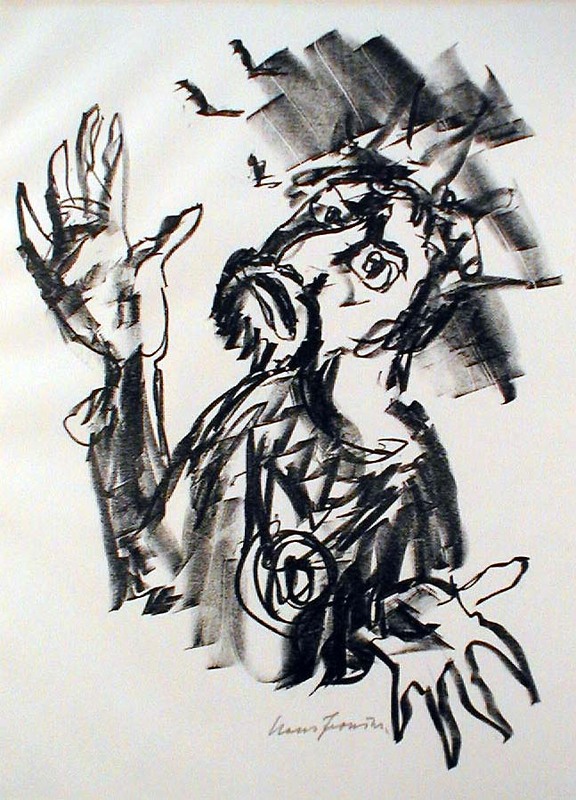 Otto Benesch, one of the most important art historians of the twentieth century, has called Hans Fronius "the most significan Austrian illustrator since Alfred Kubin" (cited Maria Buchsbaum in Hans Fronius: Paraphrasen / Paraphrases with an introductory essay by Dieter Ronte [Stuttgart: Klett-Cotta, 1986] on the occasion of an exhibition devoted to Fronius' late works at the Museum of Modern Art in Vienna). Fronius has been the subject of more than 200 one-person exhibitions at the Albertina (Vienna, 1952, organized by Benesch, and 1972), Mexico City (1957), The Venice Biennale (1957), the National Library, Madrid (1967), the Gutenberg Museum (Mainz, 1968), the Staatsmuseum, Luxemboug (1976), the Royal National Library, Brussels (1976), the Bibliothèque Nationale, Paris (1977), Centre Pompidou, Paris (1984), and many others. He has been awarded numerous prizes and honors, including the Grosser Österreichischer Staatspreis (1966), the Gutenberg Prize awarded by the city of Leipzig (1981), and the Lovis Corinth Prize of the Federal Republic of Germany (1983). 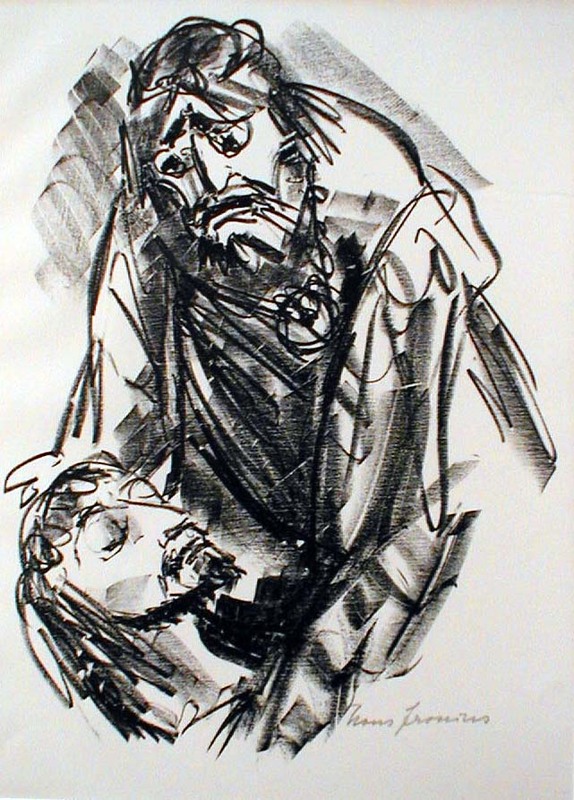 The works exhibited come from a portfoilio devoted to the relationship between the Biblical Saul and David, published (we think) in the mid 1950s and executed in a strongly-Expressionist style. Selected Bibliography: Otto Benesch and Werner Hofmann, Hans Fronius: Zeichnungen und Gemälde (Graz, 1953); Otto Breicha and Singrun Loos, Fronius. Zum Druckgraphischen Werk. Erzanzungen und Berichtigungen zum Werkverzeichnis von 1922 bis 1987 sowie Hinzufugungen aus den Jahren 1921 und 1987/88 (Salzburg: Galerie Welz, 1992: continuation and completion of Hilger and REthi); Walter Koschatzky, Hans Fronius: Zeichnung, Graphik und Buchillustration (Saltzburg, 1957); Walter Koschatzky, Hans Fronius: Bilder und Gestalten. Mit einem Werkkatalog sämtlicher Holzschnitte, Lithographien und Raddierungen 1922-1972 (Wien, 1972); Wolfgang Hilger, Hans Fronius: Eine Monographie (Vienna: Edition Tusch, 1979); Wolfgang Hilger, and Leopold Rethi, Fronius Das Druckgraphische Werk, 1922-1987 (Wien: Editions Tusch, 1987); Dieter Ronte, Hans Fronius: Paraphrasen / Paraphrases (Stuttgart: Klett-Cotta, 1986). Saul realizes that David has spared him. Original lithograph, c. 1955. Edition: 200 signed impressions for the portfolio Saul und David in der Höhle. Image size: 535x377mm. Price: $1425. Saul and David reconciled. Original lithograph, c. 1955. Edition: 200 signed impressions for the portfolio Saul und David in der Höhle. Image size: 535x377mm. Price: $1425. Untitled. 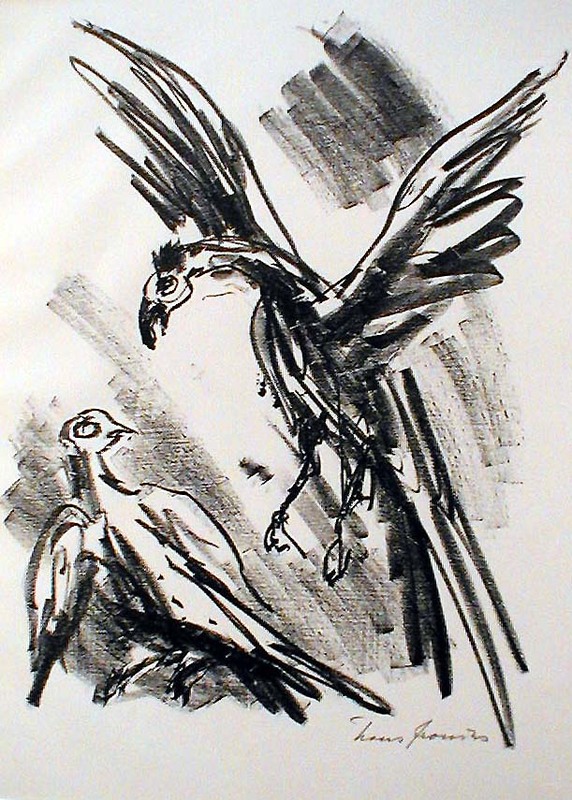 Original lithograph, c. 1955. Edition: 200 signed impressions for the portfolio Saul und David in der Höhle. Image size: 535x377mm. Price: $1425.